... well not quite. 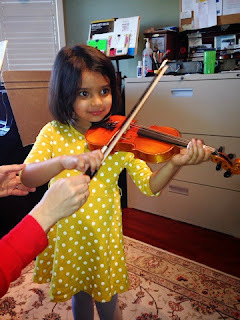 On Christmas Eve, at our aunt's house, D's cousin Divya played the violin when we were singing our Christmas carols. Since then, Cassia has been obsessed and has been asking me to play the violin. I was a bit wary as I thought she a bit young to learn an instrument. Also, as she is only now reading, how could she simultaneously begin to learn reading music. 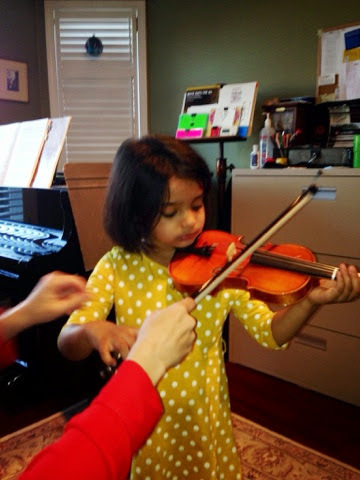 The nagging would not let up so I did some investigating and her music teacher at Kindermusik told me that violin was one of the few instruments that it's actually recommended that you start so young. 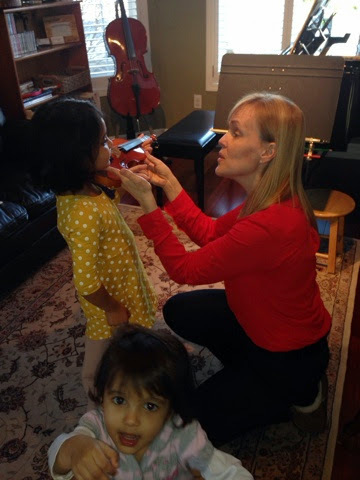 She also recommended a violin teacher who incorporates the Suzuki method into her teaching, making it easier for young kids. So we signed up. Almost $600 later (!) --- and that's just for the (second hand) violin and other materials, off we went to take our first lesson about five minutes away from where we live. The teacher is amazing, Cassia is learning quite well and so am I.... seriously, I kind of feel like I should get a violin of my own and begin to learn myself. There is so much to pay attention to! I've started a book of notes and take tons of pics (and videos) so that I can mirror the technique in our practice at home... I don't know what I did before I had a smartphone! ... Speaking of the practice though, that's the thing that Cassia doesn't care for too much. You see with all her other activities, you do the activities in a group with other kids, have some fun, make some friends and then come back home! But with musical instruments, that's not the case and it's recommended that you practise 5-10 minutes initially four-five times for the week. There's some complaining. 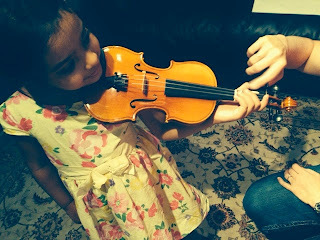 Also, the violin lessons are personalised and she has to stand when she holds the violin, also sore spots with her. 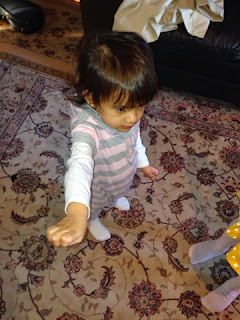 I took Anjali to the first class as D couldn't come home on time. She was her usual tornado self!